The coverage of the bloodshed in Egypt elides one crucial element regarding the role of the United States in the tragic mess: Plenty of stateside businesses are making money off the mayhem. Lockheed Martin. Raytheon. General Dynamics. Anyone familiar with the American military-industrial complex knows the big players in the game. What’s less known is that these companies don’t profit only by keeping America stocked with obsolete Cold-War-era weaponry. They also reach across borders to keep the United States locked into relationships that further fatten their bottom lines. Egypt is a prime example. Despite the August 15 announcement of U.S. withdrawal from joint military exercises, and whispers about aid “reprogramming” from Congress, the prospect of serious and immediate reductions in military aid to Egypt are slim. Egypt’s value as a geopolitical asset—control over the Suez Canal, playing nice with Israel, its leadership role within the Arab world—dictates that the tanks must keep rolling and American influence must be maintained, even as the body counts grow. But the Pentagon’s largesse doesn’t come solely from its desire for influence and access in the world’s most important energy-producing region— however much that may weigh on the minds of policy-makers. No, there are more simple motives at work: greed and job security. Not news, but the details deserve a closer look, starting with the numbers. But that’s not all. 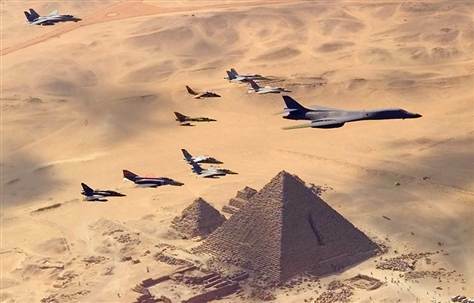 Egypt can sign multi-year contracts with American defense contractors that go well beyond the $1.3 billion figure Congress appropriates outright. These deals are based on the assumption that Congress will continue the appropriation, year after year. The U.S. has already signed more than $8.5 billion worth of contracts between Egypt and American defense manufacturers— $2.2 billion more than Congress actually approved. 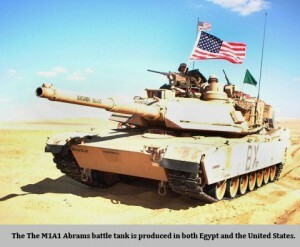 The most lucrative deal of them all: U.S.-Egyptian coproduction of a battle tank, the Abrams M1A1. Initial cost: $1.329 billion (Pentagon contract figures are routinely highballed to Congress so as to secure funding well beyond the cost of the final product. In this case, the DoD press release announces the 1.3 contract but chances are the final cost will be lower.). Chief recipients: General Dynamics of Sterling Heights, Michigan; Honeywell International Incorporated of Phoenix, Arizona; and Allison Transmission Motors in Indianapolis. Details: In 1988, the US entered a deal in which a percentage of the tank’s components would be shipped to Egypt for assembly. The remainder came prepackaged from American defense manufacturers. In 2011, the latest increment in the co-production program was finalized and the number of tanks built under it rose to 1,130. More and more deals. For the years 2009-2010, the Institute for Southern Studies lists 37 separate deals between the DoD and American defense contractors related to Egypt. These include deals for weapons, communication devices, logistical support, computer hardware/software, and in-country equipment repair—all bought and paid for by the Pentagon. Provider companies include not only weapons-makers, like Lockheed Martin, Raytheon, Boeing, and Northrop Grumman, but also household brands that Americans would recognize from television commercials, like Goodrich, Caterpillar, OshKosh, Michelin and US Motor Works. One deal on that list stands out in particular. In 2010, Lockheed Martin and the Egyptian military reached an agreement for the purchase of 20 F-16 fighter jets valued at $213 million. Just how did the Egyptian military get such a deal? 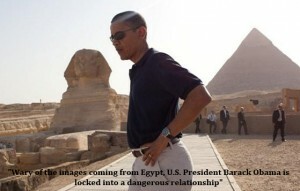 In 2007, the government of Egypt hired a handful of Beltway power brokers with thick Rolodexes. Chief among these was Tony Podesta, president of the Podesta Group and brother of Bill Clinton’s former chief of staff John Podesta. Egypt also sought out former representative Bob Livingston (R-LA) of the Livingston Group and former representative Toby Moffett (D-Conn), chairman of the Moffett Group. With Tony Podesta, the three formed a joint venture known as the PLM lobbying group in October 2007. By 2009, all three had registered with the Department of Justice (DOJ) as foreign-agent lobbyists for Egypt. The agreement resulted in payment of $1.1 million per year to facilitate American corporate and government contacts with the Egyptian government. As it turns out, PLM had cash to gain on both sides of the deal. Among the Podesta Group’s clients at the time were BAE Systems, General Dynamics, and Lockheed Martin. The Livingston Group hawked Raytheon’s wares. This is all in addition to the healthy roster of lobbyists each contractor maintains in-house. Members of Congress have a substantial incentive to keep the appropriations flowing, no matter what bloodshed occurs: If they were to abrogate those deals, the government would be liable for civil suits from weapons makers demanding compensation for lost profits. If Congress cut off the flow of money, blue-collar jobs would be lost in districts across the country. And defense behemoths would think twice before sending a big fat check to key committee members come re-election time. Don’t expect the big media to cover anytime soon these lucrative Stateside business deals that facilitate bloodshed and anti-American sentiment in Egypt. After all, if big advertisers like Boeing and McDonnell Douglas get offended, they might pull some of those ads you see on cable channels night after night. And here’s one news flash you surely won’t see on an upcoming Meet the Press: General Electric– owner of NBC and its news divisions– was just awarded a $14 million contract to service eighteen F110 fighter jet engines for the Egyptian Air Force.